Big Dot won her 9 boat division at the 1996 Single Handed Transpac Race, over 2000 miles from San Francisco to Kauai's Hanalei Bay, and was 2nd overall in the 16 boat fleet. Big Dot's elapsed time was 16 days, 7 hours and 43 minutes and she averaged 5.26 knots for the 2120 nautical mile race. Bruce Schwab's 39' Rumbleseat, the pre race favorite was the overall winner. Big Dot was skippered by a 55 yr old high school teacher named Doug Graham from Antioch, CA racing his 1977 Pacific Dolphin to Hawaii - his retirement gift to himself. 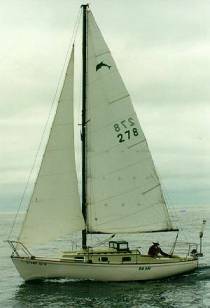 Doug bought his Pacific Dolphin in 1993 – a stock boat with an outboard in the transom well. When not in use it was stored below. He made a few changes. The boat ‘oil canned’ in the bow sections so he reinforced the area with additional fiberglass. He also added a 2” cockpit drain. That mini dog house was made of teak and plastic and gave Doug a chance to peak out and see how BIG those Pacific waves really were from the safety of the cabin. He was very happy with his Navik windvane and in particular the way his twin jibs worked downwind. There is a lot more to Doug and Big Dot’s story and we hope to get much more of it. The following is the full text from the event press release. "Safe and secure can be boring," notes Doug. While most of us might think of teaching high school in these troubled times as anything but safe, secure or boring, ever since he started sailing six years ago, Graham has looked to the water for fulfillment. "My friends think I'm crazy to do this," he says. "I'm just thankful I can call it a race, and do it with a group equally as crazy." Although sailing the tiniest boat, Big Dot (named for his wife, Dotty), Doug is considered by some to be the race's dark horse. "With that rating, he could get there a month after everyone else and still win," laughs odds-on race favorite Bruce Schwab. "I'm more scared of that boat than any of the others." To Graham, though, the '96 Singlehanded TransPac is about personal accomplishment, not hard-driving trophy hunting. "The milestone for me," he says, "will be just getting there." Graham has put a good bit of work and gear into the boat to do this race, including extra cabinets, a little doghouse, solar panels and almost all new standing and running rigging. Echoing the sentiments of other married boatowners everywhere, Doug notes, "My wife doesn't understand how I can spend so much on such a little boat!" Like most of his peers, Doug will get the rest he needs by taking 2-hour naps during the day. He'll stay awake from midnight until dawn. Also like many competitors, he looks forward to opening a 'halfway package' from Dotty. In a milestone of another kind, the race is something of a retirement gift Doug is giving to himself. 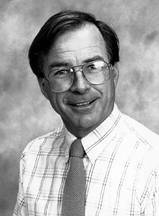 June marks the "grand finale" in his career as a teacher. Graham offers special thanks to his wife "who didn't always encourage me, but always said, 'buy it'." Navigation: Garmin GPSs (2), sextant backup; Steering: Navik windvane, Navico autopilot; Food: One-pot meals, stew as long as the fresh food holds out, then canned and dried. Kevin O'Leary (Delphinidae) has been in touch with Doug and has extracted from him some of his fascinating Big Dot story. Here it is in a couple of installments. It has been twelve years since that adventure. I have been building and sailing 12’ San Francisco Pelicans for racing and cruising since then. I chose a Dolphin because I like the traditional look, and I wanted the potential to cruise. I didn’t like the expense of the marina year round, and I enjoy working on my boat at home. After a solo trip from San Francisco to southern California, I decided I didn’t want anymore solo ocean sailing, but I wanted to learn more about sailing. In 1994, I joined the Single-Handed Sailing Society in San Francisco. Before this, my sailing knowledge came out of a book and my own experience. I learned a great deal about racing and cruising in this organization. I kept improving my boat and skills, and I decided to do the Long-Pac, which is a race 200 miles out into the Pacific Ocean and back. It is rough sailing off the Pacific coast, and after getting slammed about for five days, I wanted no part of the Hawaii race. However, I kept improving the boat, equipment, and my skills. Eventually, I got to the point where I just had to do the Transpac. I suppose I was driven to do this because I can’t resist a challenge. I was afraid of this challenge, but extensive preparation and experiences in local races and cruising helped give me the courage. The Single-Handed Sailing Society also had about eight monthly meetings with speakers on each phase of the preparation. My wife, the reluctant sailor, went to these meeting with me to make sure I wasn’t taking any shortcuts. She insisted I have an SSB, which led to the necessity of a generator. I spent over $10,000 getting the boat ready for the trip. After the Transpac, I did sail down the coast in a race to Santa Barbara with my son, and then went on to Ensenada, Mexico with a friend. Reluctantly, I sold the boat in 2000 because I was looking for new challenges. I would have liked to have gotten a bigger and more comfortable boat and joined the cruising life part of the year, but my wife, whom I love, is of a different temperament. I think SSS members questioned my ability more than the boat for the Transpac. My non-sailing friends in Antioch questioned both. Regarding my experiences at sea, I would say at times I was scared, lonely, and discouraged. You can’t dwell on this aspect of a solo voyage or you will drive yourself crazy. I was in touch with others in the race twice a day, and I called my wife every third day. I read a lot and designed a camper for my truck, which I built when I got home. I checked the rigging and wind vane hardware once a day. The longer you are at sea, the more you are in tune to your environment and you also become more sensitive to its moods .I slept whenever I felt tired, usually about one or two hours at a time, unless a squall came through, when I had to lower the twin head-sails. I spent most of my time down below. It was always kind of amazing that the boat was still going when I woke up. I couldn't’t let myself worry about other boats and ships. Most of the trip was out of the shipping channels. At night, I kept a strobe going on top of the mast and the VHF on Channel 16. Unlike some of the boats, I didn’t have very many mishaps. I tore out the tack on one of the twin headsails, but I was able to repair it. On the return trip, I heard a banging against the hull during rough weather. It turned out to be the headstay. It didn’t take long to drop all sails. It turned out to be a broken turnbuckle. I replaced it with a spare. During one of the squalls on my approach to Hawaii, I lowered all sails and I was still doing four knots. I use a spinnaker in light air, but it required too much attention and worry. I mostly relied on a set of used twin headsails, especially at night, on my way to Hawaii. With the CB up and the twins pulling, I could ride a wave for a long ways! Here are some of the modifications I made to the boat. I reinforced the bow area with fiberglass to prevent oil canning. I put in large cockpit drain holes leading into the engine well. I rigged the boat so I could raise and lower the mast myself. I built doghouse to replace the hatch cover, so I could stand up down below and look out. My daily routine was mostly boring. Radio check-in was usually the highlight. When you are alone at sea, boring is good. Cooking was one pot meal on a sea swing stove. The head was a bucket. Showers were a sunshower in the cockpit. I plotted my position on the chart a couple times a day. I navigated with the GPS set for Analgesia Bay, Kauai. I set the deviation for + or – 5 miles. I usually had to adjust the wind vane every four hours. I motored through most highs on return trip using autopilot. What did I learn about myself and the boat? I think the boat and I became one. I took care of the boat and the boat took care of me. A third party on the trip would have to be the elements. All three of us worked together and responded accordingly. The longer you are on the water, the more you feel a part of your boat and the environment. I still find it amazing that I accomplished this feat. I learned that I am made of more than I thought. Hope you are very well. I am in Santa Cruz at a sailing school and saw the Dolphin 'Gracie' on the hard parked at Aquamarine Boat Works. That Dolphin belongs to the owner of the boat yard (don't know his name yet). He bought it from someone who bought it from Mr Graham, the teacher who sailed it in the 1996 Transpac and came in second. So it had another name ' Ms Dot ' or something like that ? I have to ask the owner his name and see if it is the right hull # of Ms Dot. He is working on repainting it and putting on new rigging. © Copyright 2007. All Rights Reserved.